​In many cases cars have tinted windows that don't meet required standards. Different localities enforce these regulations with different degrees of intensity. You can inquire of your local police if they enforce the standards. If you need to meet these regulations, the transmissivity of the tinted windows have to be tested and compared with the regulations. The transmissivity requirements can sometimes be brought into compliance by replacing some of the film. 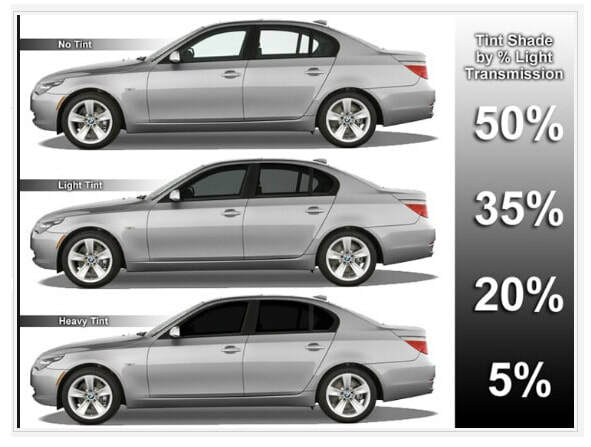 Since different windows on a car have different requirements, one need not always replace all the tinting. ​​In any case, if you know the transmissivity of the tinted window and the requirements, you can decide what to do depending on the state or locality where you live. If you need us to remove or replace tinting to comply with standards, we will be happy to give you a quote. If you just want to remove the tinting, we can give you a quote for that service, or you can try to do it yourself using one of the methods mentioned here. Remember, we have printed instructions for each of the methods. ​We will be happy to give them to you with no obligation. Just call us.